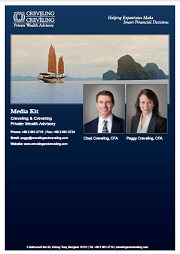 As globally recognized experts on financial planning―and as long-time expats themselves―Chad and Peggy Creveling can provide targeted and thoughtful insight on issues that matter to the expat community. If you’re looking for an informed, balanced source for a story relating to expat financial concerns, please contact us today. We’ll be happy to talk with you and answer your questions. If we can’t provide the information you need, we’ll gladly refer you to one of our contacts in the financial planning and investment community who we think will be able to help you. If you have a press request, please email us at media@crevelingandcreveling.com or call +66 2 661-2716. View our other articles and publications here.